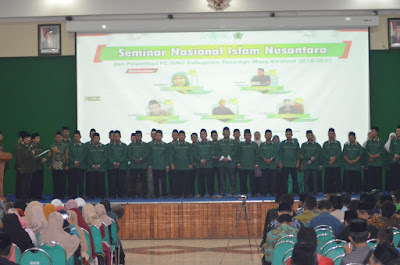 Thursday, December 27, 2018 was held Inauguration of Branch Manager of ISNU Ponorogo Regency (Pelantikan Pengurus Cabang ISNU Ponorogo) Service Period 2018-2022 and seminar on the topic of "Nusantara Islamic Literacy" in the Hall of Watoe Dakon IAIN Ponorogo with speakers Prof. Masud Sa'id, KH. Ahmad Baso, and Dr. Aksin Wijaya. ISNU is Scholar Association of Nahdlatul Ulama, the youngest NU Autonomous Agency (Banom), but has a big goal to collect NU scholars with various backgrounds and professions. Stretching was seen by the presence of ISNU management organization from the central, regional, branch, to subdivision levels. With this management hierarchy, ISNU intends to actualize the potential of NU's scholarship vis a vis social and community problems and nationality. Various real problems that threaten our lives include various cases of violence, intolerance, religious puritanism, corruption, digital crime, and many others. This is in line with Indonesia's human development index which is still ranked 113 out of 188 countries (GLN Guide: 2017). Various problems above are caused by the fragility of literacy in some of our society. Literacy is certainly not just the ability to read and write the text, but the ability to use all potential and skills for the benefit of life. The national literacy movement classifies literacy dimensions into 7 types: basic literacy (the ability to read and write), numeracy literacy, scientific literacy, digital literacy, financial literacy, and cultural and citizenship literacy. This classification confirms that literacy has a comprehensive spectrum. The comprehensive of spectrum demands the involvement of all stakeholders in accordance with their respective capacities and abilities. ISNU Ponorogo affirms the direction of the organization's struggle for the literacy movement by collaborating and synergizing with internal and external parties. There are several arguments for why this direction of struggle was chosen. First, ISNU/NU is a civil society force that demands solitary roles for socio-cultural, socio-economic and socio-political problems. The strength of civil society that synergizes with the Government is a necessity in the context of a democratic system. ISNU and NU as the strength of civil society are contributions to the nation and state. The strength of NU civil society can be seen if this organization is able to produce collective social movements in response to the present problems of society, nation and state. It cannot be denied, NU has always been involved with the history of Indonesia, but NU's involvement and role in the interests of the nation and state must always be contextualized. The contextualization, among others, led to the literacy movement amid the uncertainty of the age situation due to the digital revolution. Second, ISNU literacy movement is an effort to realize "organic intellectuals" of NU scholars. Organic intellectuals are those scholars who are not in the "ivory tower" that just read-write-speak for science interest (science for science), but intend to make changes based on that knowledge, that is how to change and not just how to know . The literacy movement actually inductive-empirical to respond the fragility of public literacy which results in the emergence of various social diseases. The literacy movement also intends to articulate emancipatory aspirations and interests of the people which are often clogged up by hegemonic political and bureaucratic structures. Third, NU is the largest religious social organization in Indonesia. NU "jama'ah" is far greater than NU "jam'iyyah". When the Human Resource development index is not yet an encouraging target, most of them are NU residents. The ISNU literacy movement is basically an internal awareness to advance with strategies and patterns that are not forced from external parties. In the ISNU concept, "becoming advanced" is not identical with abandoning tradition and cultural values. The strong slogan in the NU community is al-Muhafazah ‘ala al-qadim al-shalih wa al-akhd bi al-jadid al-ashlah. Therefore the literacy movement is basically an effort to combine the tradition (turast) with the current development. Fourth, the ISNU literacy movement can be interpreted as an effort to oppose the "demoralization of the NU khittah" movement by those who use the NU community for practical political interests. The literacy movement is the realization and enlightenment of the importance of civil society which is empowered to vis a pragmatic practical politics and hegemonic power. Literacy realizes the diversity of NU's political aspirations. NU is a berth for all its citizens which requires far from practical political pulls. The ISNU literacy movement is a form of popular political movement which is certainly different from the politics power. While power politics often politicizes religion and political religionization, popular politics uses the language of humanity to greet marginalized people. This is the spirit of religion which is the basis of the literacy movement. Fifth, the ISNU literacy movement is a response to a wave of religious puritanism. Puritanism massively considers absolutism, by absoluting the khilafah state as authentic Islam. Thus, the ISNU literacy movement is a counter to the discourse on the puritan discourse of diversity. In this context religious literacy movements are inevitable. The religious literacy movement aims to provide knowledge, understanding, awareness and correct religious meaning, not merely ideology. Religious literacy links interactively between text and context. Not only "textualization" context is needed, but also "contextualizing" the text according to space and time. The concept of the indigenization of Islam and "Islam Nusantara" is part of the example of textual contextualization. The argument of NU scholarship literacy movement above can only be achieved with commitment and cooperation with various stakeholders. ISNU as NU's youngest Autonomous Agency (Banom) is awaiting its work to prove itself as "is NU", borrowing the Muhammad Nuh's term. "Is NU" is a description of ISNU as an intellectual group that can coloring NU and guard Islam rahmatan li al-alamin. Hopefully.! Abid Rohmanu, Chairman of ISNU Ponorogo Regency.